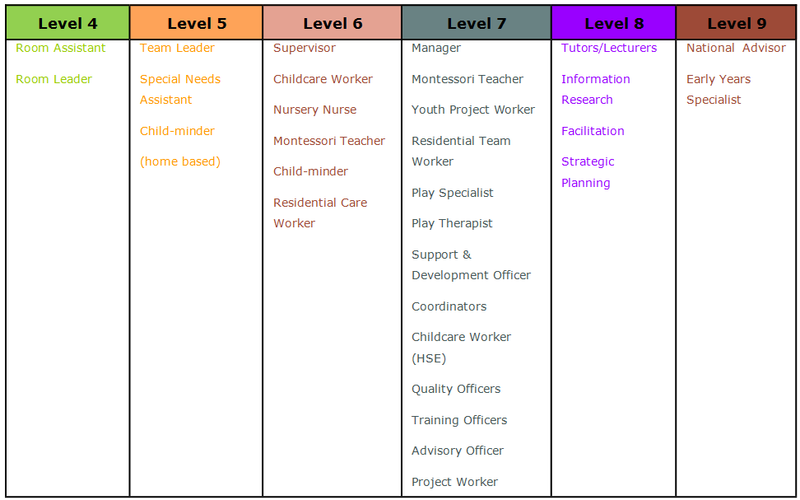 Staff Qualifications Pre-school Leaders must hold a certification for a major award in childcare/early education at a minimum of level 6 on the National Framework of Qualifications of Ireland (NFQ) or an equivalent nationally recognised qualification (click here for a list of approved equivalent qualifications) or a higher award in the childcare/early education field. In the case of pre-school services registering with the Child and Family Agency from 1st September 2015, pre-school leaders must hold a certification for a major award in childcare/early education at a minimum of level 6 on the NFQ, and all staff working with children in the service must hold a certification for a major award in childcare/early education at a minimum of level 5 on the NFQ. From 31st December 2016, the pre-school leaders in ALL services participating in the ECCE programme will be required to hold a certification for a major award in childcare/early education at a minimum of level 6 on the NFQ, and all staff working with children in the service will be required to hold a certification for a major award in the childcare/early education at a minimum of level 5 on the NFQ. The content of all relevant major awards must include significant content on Child Development 0 – 6, Early Childhood Curriculum and Child Health and Welfare. The course must also have included Supervised Practice in an Early Childhood Care and Education setting. It is now accepted that learning does not have to end at a specific age and that people need and want to continue learning for life. In order to support this trend a new National Framework of Qualifications has been set up and developed. The National Framework of Qualifications is a system of ten levels, each of which has nationally agreed standards setting out what you are expected to know, understand and be able to do following successful completion of a programme.